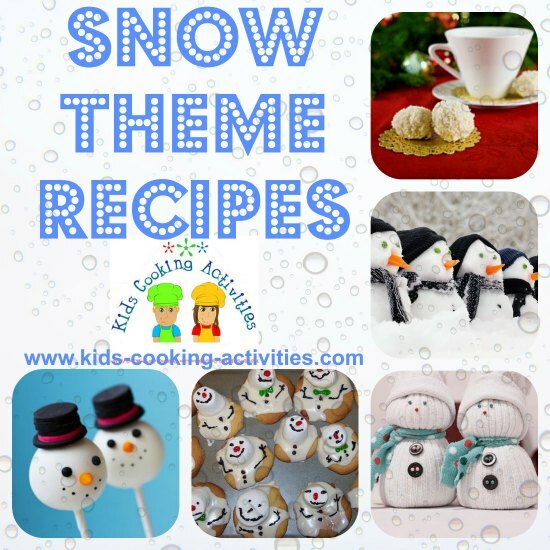 Your snowman theme party can include snowman recipes or just some fun snow recipes. Dress in winter attire, have a picnic in the snow or next to a fireplace. 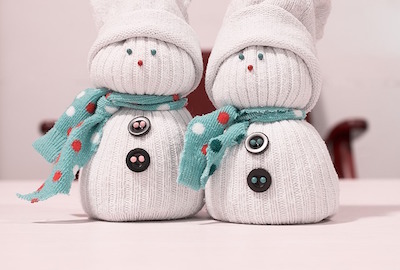 Build an easy snowman or use one of the snowman recipes as your centerpiece. Cream butter and sugar together in mixing bowl. Add egg and lemon juice. Blend together. Add dry ingredients, salt, baking soda, cream of tartar and flour. Stir together until well blended. Preheat oven to 350 degrees. Roll dough into small balls and place on cookie sheet. If dough is too sticky to handle chill for 2 hours. Bake snowball cookies for 10-12 minutes until bottoms are lightly browned. Move to cooling rack or sheet of waxed paper. After cookies have cooled slightly so you can handle them, roll them in powdered sugar. Makes about 24. In mixing bowl cream butter, sugar and egg together. Stir in vanilla, salt, and flour to creamed mixture and mix until well blended. Preheat oven to 350 degrees. Roll dough into balls hiding a chocolate candy inside each ball. Place on cookie sheet and bake for 10-12 minutes until bottoms are lightly browned. Move to cooling rack or sheet of waxed paper and cool several minutes. Roll each cookie in powdered sugar and place on serving platter. Enjoy! Makes about 30. For a different variation of this recipe you can omit the chocolate candies and add in 1 Cup mini chocolate chips to the dough. Then form into balls and cook. In small oven safe dishes, often called ramekins, place broken cookies into bottom of dish. You will need 6 -3 inch ramekins for this recipe. Add your favorite ice cream to the ramekins to fill the dish. Place the ramekins in the freezer while you finish preparing this fun cold weather recipe. Preheat oven to 400 degrees F. In mixing bowl add the egg whites. With your mixer whip egg whites several minutes until they look like soft peaks. Add the cream of tartar, sugar and vanilla. Continue whipping in the mixer for several minutes until peaks become stiff. Take the ice cream out of the freezer and add the egg white mixture(known as meringue) to the top of each ice cream dish. Completely cover the ice cream with the meringue. 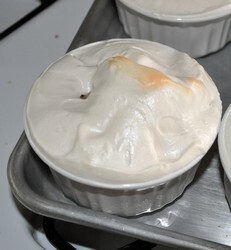 Place on cookie sheet and bake for 5-10 minutes until the meringue is browned. This won't take long to brown. 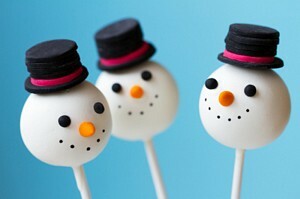 Now you have your baked snowballs that you can decorate with chocolate syrup or eat as is. In a mixing bowl combine cream cheese, butter and vanilla. Cream together. Add in powdered sugar. Blend. Stir in cookie crumbs. Shape into a ball. Lay out a sheet of plastic wrap and scatter powdered sugar over the top. Place dessert ball on top of sugar and roll around to coat entire ball. Wrap up in plastic wrap and chill several hours. Serve with graham crackers, plain vanilla cookies or shortbread cookies. No matter what time of the year it is, this delicious finger food will satisfy everybody! 1. Combine the Oreo crumbs, pecans, and 3/4 cup of powdered sugar in a large bowls. Also, add the corn syrup and preserves. 2. Stir well till it is well blended. 3. Shape the mixture into 1 in. balls, like snow balls, using an one level tablespoon of the mixture. 4. Roll each ball in the 3/4 of powdered sugar and roll it again so it'll be well coated, and for it to look like a snowball! 5. You can put it in a airtight container for 1 week! Enjoy! This makes around 28 cookies! Beware: Do not use these in snowball fight. Fold the tortilla in half, and then in half again. Give the child a clean pair of scissors and have them cut out shapes.....so that when you open up the tortilla it looks like a snowflake. Melt some butter in a frying pan and cook the tortilla for a couple of minutes on each side until it just starts to turn golden. Remove from pan and put onto a large tray or plate that has liberal amounts of icing sugar on it. When the "snowflake" is coated, eat it and enjoy! 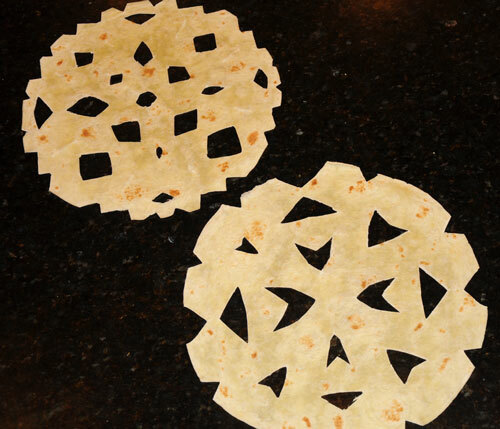 ** Demonstrate on paper the day beforehand how to make paper snowflakes. Prepare a cake mix and bake in two round cake pans. One cake pan smaller than the other. One will be the bottom of the snowman one will be the top. Allow to cool and frost with white frosting. Sprinkle shredded white coconut over all of frosting or leave without. Add gumdrops or other candies for eyes and a nose. Add licorice whips for a smile. Add chocolate candies for buttons and pretzels sticks for arms. 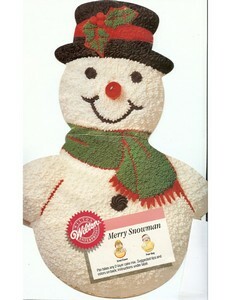 Wilton also has a snowman cake pan. Pop popcorn and set aside. In a saucepan over low heat, melt butter and marshmallows. Stirring constantly until smooth. Stir in vanilla. Pour over popped pop corn and mix until well coated. With buttered hands form into snowball shapes. Make two balls. 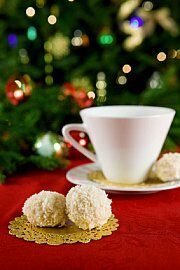 Melt white chocolate in a microwave safe dish. Stirring every 30 seconds until completely melted. Add melted chocolate on the top of a ball and place another ball on top of the chocolate. Lay down and hold if needed until hardens. Use melted chocolate to attach candy or nuts for eyes, nose, mouth and buttons. * We used an Oreo for a top hat and black gel to make a smile. Add a spoonful of melted chocolate to a plate and place the snowman on top. Let harden. Place mashed potatoes into three ball shapes on a plate. 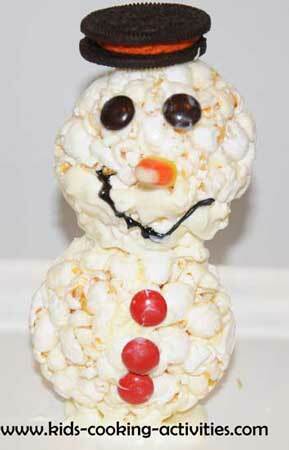 Or use just one mashed potato ball for the snowman head. 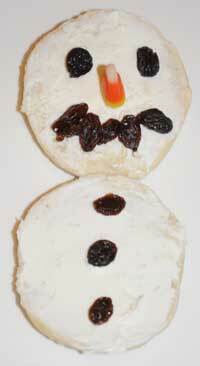 Decorate the snowman with a carrot stick nose, green peas for eyes and an olive slice for a mouth. The perfect cold weather recipe your kids will love. Baked sugar cookies and allow to cool. Add a large marshmallow with a dab of frosting. 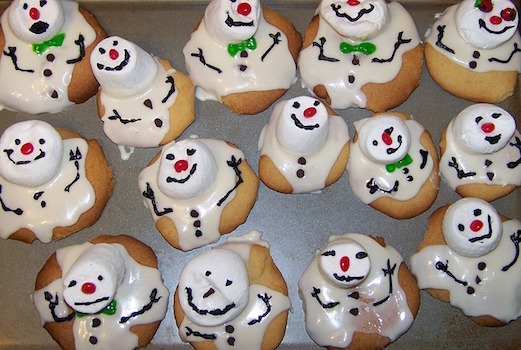 Continue to frost around the cookie looking like the snowmen are melting. Add embellishments for eyes, nose, mouth, etc. On the 2 slices of bagels, spread cream cheese evenly. Add 2 raisins for eyes. Add 4 raisins for mouth. Candy corn nose or other candy. Add buttons. Put Oreos and cream cheese in food processor, when not quite creamy roll into 1 inch balls and freeze until cold. Melt chocolate in a bowl and take out frozen Oreo and cream cheese balls. Put one ball in a time into the chocolate and move around until completely covered in frosting and take out with fork. Let excess chocolate drip back into chocolate bowl and put chocolate covered Oreos ball on a parchment covered cookie sheet. When done with all of the balls, put cookie sheet in the freezer until cold or frozen. Add a smile to each ball with the black gel and two dots for eyes with the orange frosting. Create cake pops and dip in white melted chocolate. Add half of an Oreo, frosting side down, to the head and attach a smaller mini Oreo to this one with a drop of frosting to make the top hat. Or mold a hat from black fondant. Flattened black sprinkles look just like coal eyes, orange sunflower seeds strongly resemble tiny carrot noses, and little edible ink dots create the perfect snowman smile. Take me to more theme dinner ideas from Snowman theme party.